Veterinary Surgical Oncology provides in-depth coverage of surgical techniques for treating cancer in small animal patients. Organized by body system, each chapter presents detailed, well-illustrated descriptions of surgical procedures, with additional information on diagnostic testing, aftercare, outcomes, and prognosis. 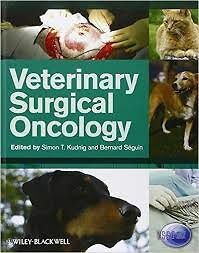 Edited and authored by members of the Veterinary Society of Surgical Oncologists, Veterinary Surgical Oncology's comprehensive coverage of surgical treatments for cancer provides an invaluable decision-making tool and is equally useful for veterinary surgeons and veterinary oncologists. The book begins with introductory chapters on the principles of surgical oncology, multimodal therapy, and interventional radiology, then presents chapters on surgical techniques in all anatomical structures, including procedures not well covered in existing literature. The first book to focus on the surgical aspects of cancer treatment, Veterinary Surgical Oncology is an essential reference for anyone with an interest in surgical oncology.